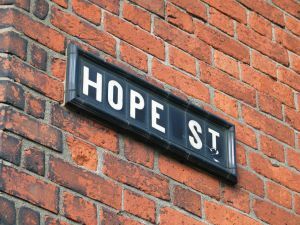 What Would You Find On a Street Called Hope? You can find Hope Street. I walk down it in my mind. A knowing look shines on the faces of the people I see. Most can’t say how they found their way to Hope Street. I can say that I don’t go there as often as I might. Oh, Liz … I’d find house after house of women who were cured of breast cancer, either miraculously or through medicine. Love this image … love it. What would I find on Hope Steet? Opportunities, positive outlook, and the compelling lyrical call of a brighter, better future. I’m pretty sure I’ve seen you there! Liz, it would be like the little town I lived in as a child- people held doors open for each other, left their doors unlocked, sold antiques and knew what yo-hoo and bazooka was. On Hope Street, people are tolerant even when they fear things that are different. On Hope Street, we all aim higher and mind each others’ paths. I think Hope Street exists, it’s just a mindset we each have to seek out and *choose* to be on! Yeah, I think the image would make a beautiful poster. It’s a reminder. I could use it near me every day. I hear the hope in your comment and the joy there. I think Hope Street would welcome you in. I agree! I think hope is a choice. Though somedays, I forget. Most days I know that hope makes the sky and the people shine brighter. What a wonderful image, Liz. On Hope Street, I see desperate people finding what they have been searching for. Them coming alive as they stop for a scoop of encouragement and support along the way. Hugs are freely given on every corner. The air is filled with optimism. Opportunities are abound. Bright, lively flower baskets and gardens plentifully grow along Hope Street. Hope Street is the street I’m on today. The sun is shining in my eyes when I look at the faces that look back at me.